>> Surfboard Sizing Guide For Noobs – What Surfboard Size Is Right For Me? Surfboard Sizing Guide For Noobs – What Surfboard Size Is Right For Me? 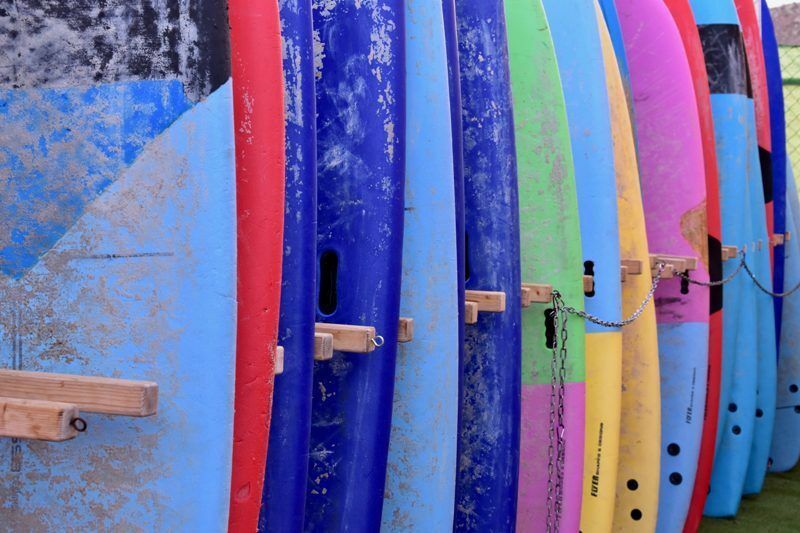 Whether you want to surf as a workout, for fun, with your family or to become a professional, there is one common question that most will ask – what surfboard size is right for me? Unfortunately, no one can tell you. It's not a general answer, as what works for some people won't work for everyone else. There are more factors to take in consideration, such as surfboard types and sizes, your expectations, skills, weight, height, waves and so on. But then, assuming that you already know what kind of boarding you want to do (and you choose the right type of board), here's what you have to focus on based on your skill level. If you're new to this sport, a surfboard size calculator might give you a few hints, but generally speaking, go for a longboard. Sure, longboards are not as appealing as short boards, but you're new to it and you have to forget about your ego for a bit. Think about it for a minute. It's much cooler to dominate and maneuver a longboard that trying and failing with a small board. In terms of sizing, it depends on the height and weight. Assuming that you're not overweight or too skinny, you should normally get a board that's 3 feet longer than your height. It's a general rule of thumb. The surfboard thickness is not so important as you learn. If you're not planning to become a professional but you just want some fun, it might be worth looking for the best all around surfboard. Check out our verdicts on the top 5 surfboards for beginners, here. Assuming that you do have some experience and you can maintain your balance, your options are more diversified. You can opt for a longboard, but you can just as well push harder with a short one. Each type has its own characteristics and uses. For longboards, get one that's 2 or 3 feet longer than your height. If you want a short board, opt for something that's about 5 inches longer than your height. Of course, it depends on whether you want to surf as well. Fun boards are just as common and mostly depend on your weight. Therefore, check out the maximum weight they can take. As for the surfboard weight, it's a matter of personal necessities. Think about transportation, but keep in mind that although they're more stable, heavier boards are a bit harder to control and they demand more effort. If you have experience and you consider yourself an advanced surfer, you probably don't need a guide. At this point, you know exactly what works for you, whether you count the size, weight or special features. So, what surfboard size is right for me? It's hard to tell because your answer must be individualized. Familiarize yourself with the most common types and consider your personal necessities and expectations. Once you have all these details, making an informed decision is a matter of time only.